TAMPA, Florida – June 12, 2018 – McNICHOLS CO., announces the launch of a completely redesigned mcnichols.com to provide customers with a more accessible and enjoyable shopping experience for McNICHOLS® Hole Products. The new website is now mobile friendly and offers customers an enjoyable shopping experience across all of their devices. At the office, in the shop, or at home, mcnichols.com is available 24/7 to browse Hole Products and access a large library of Product Resources. Added site speed and infrastructure means customers can expect a smooth online experience. Plus, navigating the new site has been made even easier due to improved product filtering and search tools. In addition to enriched product imagery and descriptions, a range of Hole Products include the ability to rotate 360 degrees around the item. Also enhanced is the McNICHOLS® Product Gallery, an interactive resource where customers can view some of the endless applications for McNICHOLS® Hole Products. The new mcnichols.com is specifically designed to help customers make more informed product selections, initiate quotes more quickly, and learn more about McNICHOLS® Value-Added Services. "We believe that developing and launching the new site gets us one step closer towards improving the customer experience" said Scott McNichols, President. "We are committed to not only meeting but exceeding customer expectations, and that includes providing them with best-in-class technology and more importantly, an unforgettable online experience. By launching our new platform, we also arm our associates with additional tools to serve customers, boosting their confidence and ability to perform at the highest level." 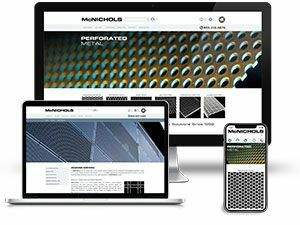 McNICHOLS, North America’s leading supplier and fabricator of Perforated and Expanded Metals, Wire Mesh, and Designer Metals, as well as Bar Grating, Fiberglass Grating, Plank Grating and Flooring products, is an industry leader when it comes to technology. Having launched its first website in 1996, including several redesigns over the years, the new mcnichols.com is a "HOLE" new online experience and starts another chapter in The Hole Story®. If you have a mcnichols.com account, an email was sent to the address on file with instructions on how to complete your registration on the new site. If you need assistance, we are available to serve you by phone, by email, or via Live Chat on our website!